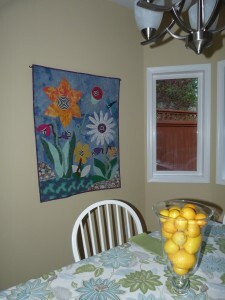 In my last blog I shared some wall quilts that are displayed in my house for staging for sale. 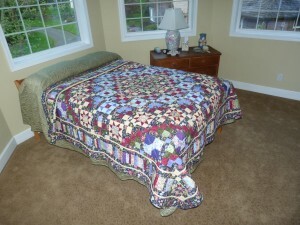 Here are pictures showing the quilts that I put on the beds. 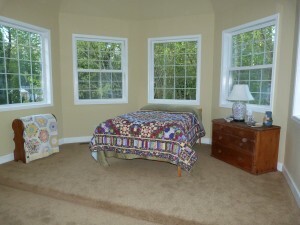 The first ones show the spare bedroom with my Kaleidoscope quilt. Large Hadron Colliderscope was made using my template-free kaleidoscope method. 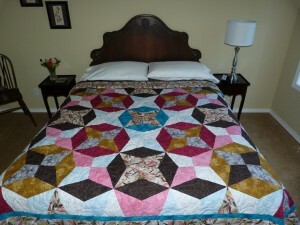 I enlarged the pattern to make this 36 block quilt and had fun designing the layout. The master bedroom is graced with Trip Around the Garden. 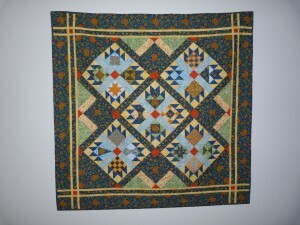 This quilt is featured in my book, Traditional Quilts with a Twist. 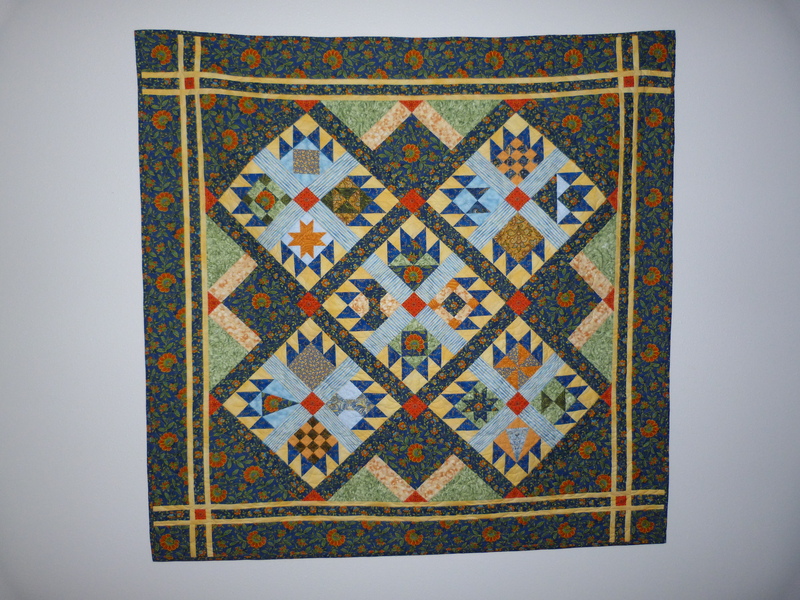 I made several quilts based on the Trip-Around-the-World theme, plugging pieced blocks into the the traditional layout of squares to reproduce the on-point patterns of color. 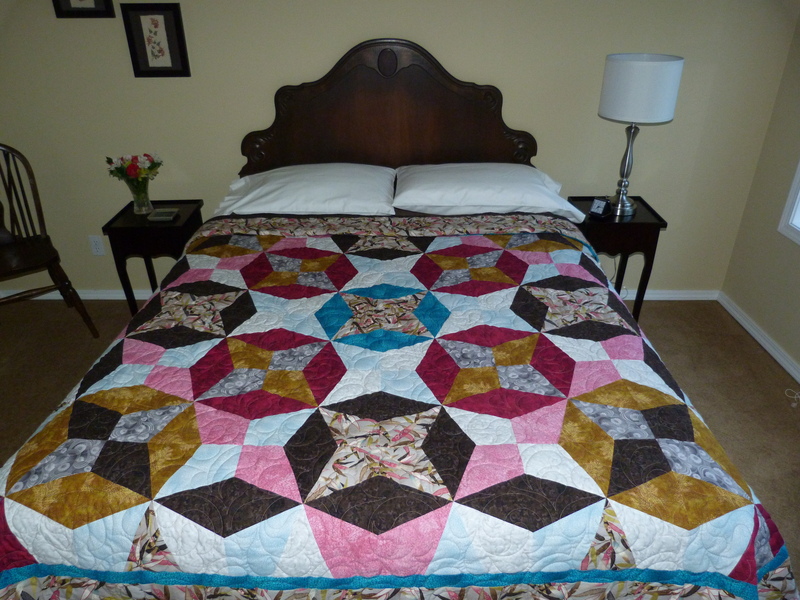 This one was made from simple 6″ blocks – 9-patch, Bowtie, Sawtooth Star, Shoofly and Ohio Star separated with the floral sashing. I used a different cornerstones in the sashing to carry the colors through and help the overall design. 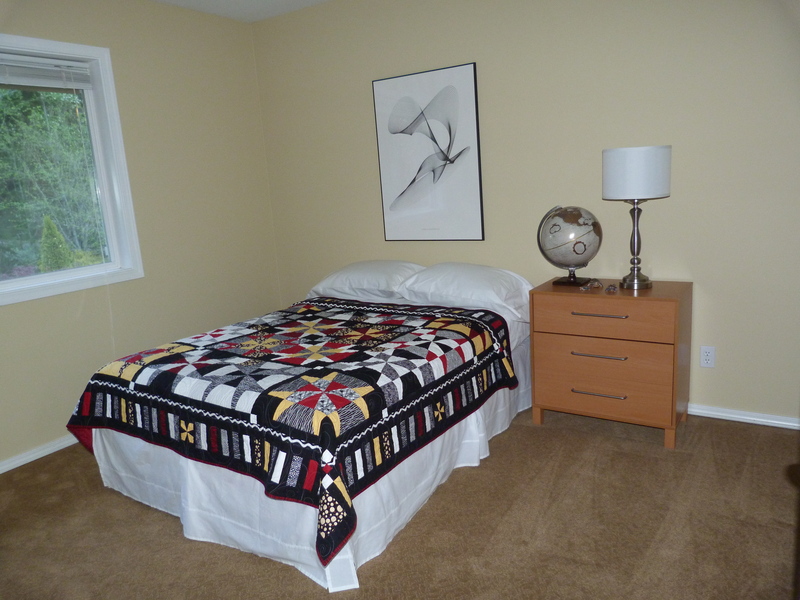 In my son’s bedroom, I went with Retro-Radiation, a quilt made from my template-free Op-Art Kaleidoscope blocks. 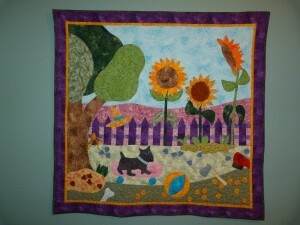 There are 16 blocks made from assorted black and white fabrics with red and yellow added to the mix. As you can tell, I like piano keys borders! Once again, my apologies for the time that has elapsed between blogs. 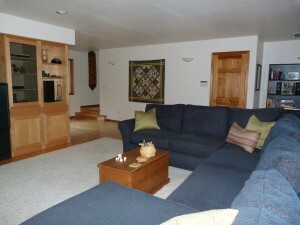 Work preparing our house for sale has been intense and all time consuming. 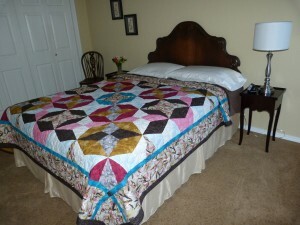 I wanted to show case some of my quilts in the staging. 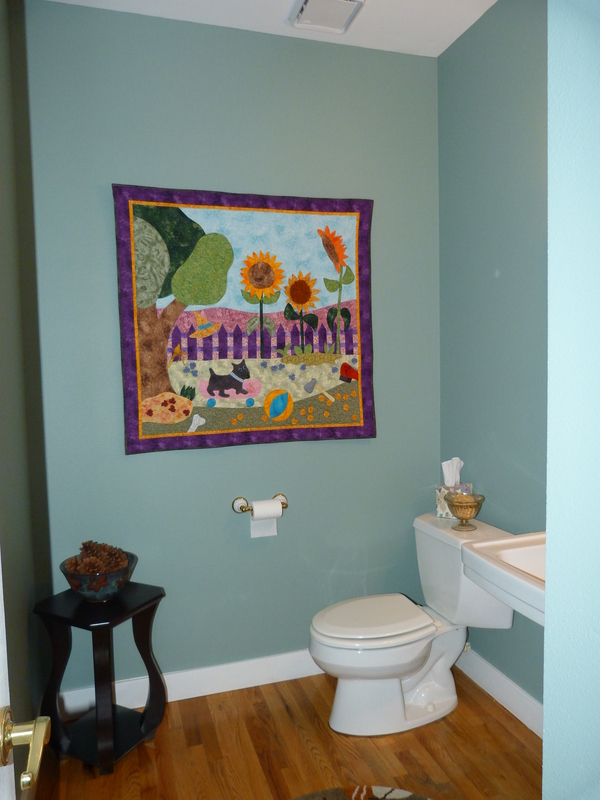 It’s a large house with several blank walls perfect for displaying quilts. Here are some photos of the rooms with quilts and closer shots of the quilts themselves. 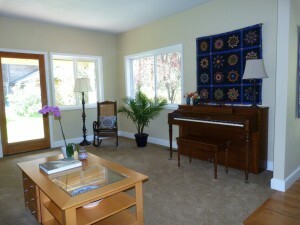 This is the family room adjacent to the kitchen and breakfast room. 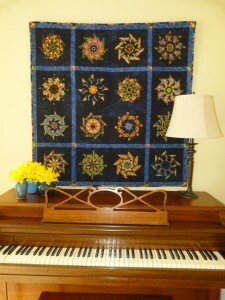 Wonders of the Deep is one of my Kaleidoscopic Pinwheels quilts. I adapted Bethany Reynold’s Stack ‘n Whack technique so that the Pinwheels float on the background. This is a fail safe method. The blocks may be trimmed so that they are all exactly the same size and the Pinwheel points remain intact and 1/2″ from the edges of the blocks. 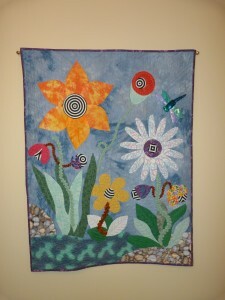 The Pinwheels stand out better surrounded by the background and the blocks look sharp. I teach a one-day class on this method. Here’s my whimsical applique quilt, Helios Searches for the Perfect stem, in the breakfast room. 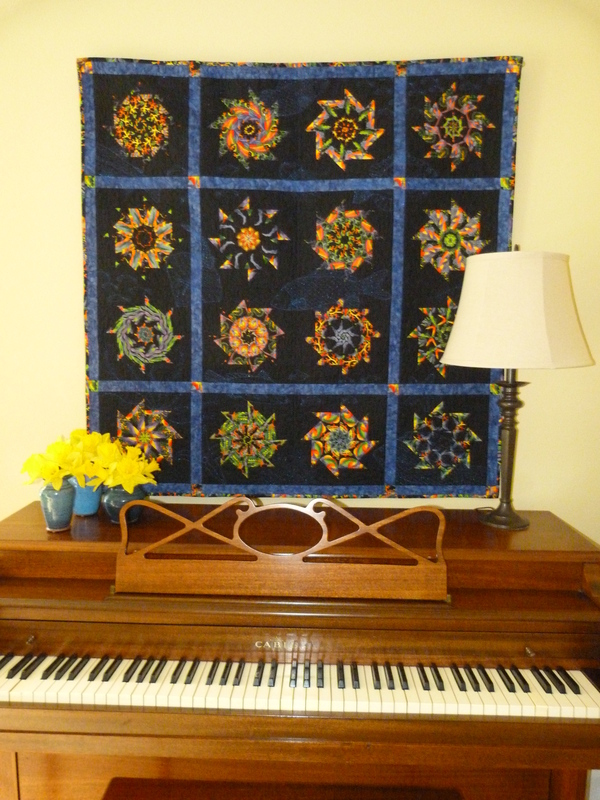 I hand appliqued the flowers, ruched the stems, and hand quilted the blue background. 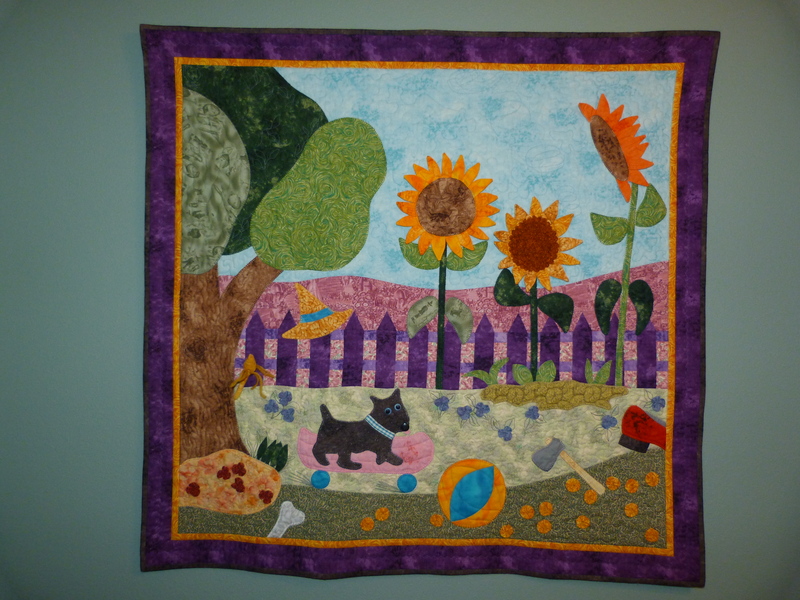 The substrate, leaves and flowers are machine quilted. The dragonfly is a finger puppet that I purchased from the Seattle Art Museum. My other appliqued quilt, Toto’s Garden, hangs in the newly decorated powder room. 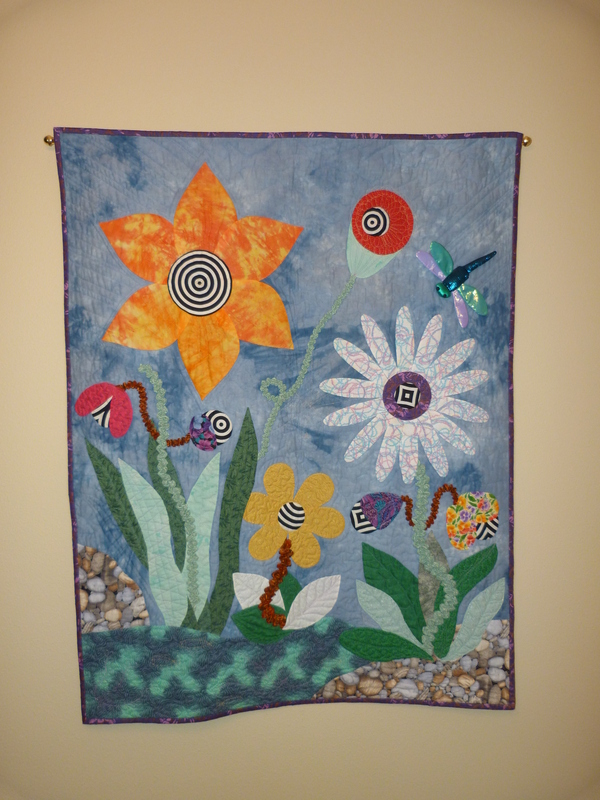 This was made for a special exhibit at Houston about ten years ago, entitled “Quilts for the Young at Heart” and sponsored by David Textiles. The fabrics were provided by David Textiles and include their Wizard of Oz prints. Toto is enjoying the garden on his skate board and has acquired various Oz artifacts such as Dorothy’s slipper and Tin Man’s axe! Tuscany Bears hangs in the entertainment room. This was one of my series of Bear’s Paw variation quilts and is featured in my book, Traditional Quilts with a Twist. The Bear’s Paw blocks contain a variety of mini-blocks instead of the traditional large squares.